At two pounds, nine ounces per pair, the Vasque Breeze XCR certainly qualifies as a light hiking boot—but don't think that means they're not durable. This is the boot I used to hike and ski Mt. Williamson's West Horn, a tour-de-force of gear-wrecking savagery involving 2500 vertical feet of dry off-trail scrambling (with skis and overnight gear on the back) plus class 4ish rock climbing at 14,000 feet. That the Breeze simply survived this expedition is a strong recommendation on its own. More impressively, the boot kept my feet safe and sound, providing critical ankle support, a cushioned sole, and a lock-down fit that kept away the blisters. Out-of-the box, the Breeze makes a good first impression: rugged and sturdy. The build quality is high, with reinforced stitching and Nubuck leather panels. Put them on, and it's immediately apparent you're not wearing a disguised trail runner. The Breeze has a stiff, plate-reinforced sole. The insole is well-padded to keep you comfortable on broken Talus. The boot as a whole provides considerable support, gripping and holding both foot and ankle. 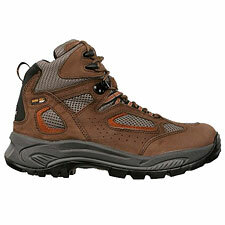 As a hiking boot, the Vasque Breeze inspires confidence under heavy (40lb) backpack loads on trail and off. I found the Breeze quite capable going uphill and down. In both directions, the boot kept my foot from shifting around—in particular preventing any issues of toe bang. With regard to fit, I did initially find the Breeze a tad snug in the toe. The length and width seemed fine: oddly, it was the vertical height of the toe box that seemed low (others have also reported experiencing this). I solved the problem by taking the boots to a boot repair shop and having the toe box gently stretched overnight (cost: $15.00, cash only please). While I normally would have just returned boots that didn't quite fit, I'm glad I stuck with the Breeze. The stretched-out box has proven wonderfully roomy, giving me a boot that I feel confident taking anywhere. The Breeze comes in two versions: the XCR-GTX model features a Gore-Tex liner to make the boot waterproof yet still breathable. Summer and Desert hikers may find the XCR a little too warm. In that case, try the non-GTX Breeze, which is highly breathable thanks to its mesh panels. With both boots you get a Vibram Contact sole that has proven very gripy on rock. Scrambling (and climbing) about on Williamson's exposed East and West horns, I was very glad to have the Breeze's extra traction. I'm always a little anxious buying new boots—it's an expensive gear item and one that has to get lots of things right. The Breeze made for a near-effortless transition from my old hiking boots. If you're seeking a lightweight hiking boot that performs like a workhorse, I don't hesitate to recommend them.